Townes Van Zandt's longtime road manager and producer, Harold F. Eggers, Jr., looks back on road-life with the haunted songwriter. He has more stories than most. The line on Townes Van Zandt has been consistent since even the early days of his career: a master songwriter and gifted guitarist with a haunted streak that was often more self-destructive than helpful. A man with few memories of his own childhood due to electroshock treatments, Van Zandt was nevertheless able to write characters with no shortage of backstory and authenticity. To many, he stands as a gone-too-soon enigma, possessed of a talent that seemed to burn away at him as much as his unhealthy lifestyle. Like nearly anyone who's risen above the crowded singer-songwriter ranks, Van Zandt had -- on top of fantastic guitar skills and lyrical ability -- his own idiosyncratic style that wasn't quite like anyone else's. Born into a prominent and historical Texas family, much of Van Zandt's style can be traced to his love of Hank Williams, Sr., and Lightning Hopkins, but what came out of such influences was wholly original. When Van Zandt died on 1 January 1997 -- 44 years to the day after Hank Sr. died -- he left behind a catalog of songs like "Pancho and Lefty", "If I Needed You", "Nothing", "Tower Song", "Waiting Around to Die", and "To Live Is to Fly" (among so many others) that are hailed as some of the best songs to come out of anywhere, much less America or Texas. Artists like the late Guy Clark and Lyle Lovett routinely include Van Zandt songs on their albums, while Steve Earle released an entire album of Van Zandt covers. Even now, more than 20 years after his death, Townes Van Zandt records continue to be released. By and large, these have been reissues, live recordings, or re-recordings that Van Zandt made later in life. The release of Sky Blue, a disc of previously unreleased recordings from 1973, was just announced, with more releases surely on the horizon. Since Van Zandt rarely played a song the same way twice, these archival releases have contained their share of unexpected gems. Van Zandt's legacy has never been confined to his music, however. Tales of reckless and self-destructive behavior seem to find their way into any discussion of Van Zandt. It's said that everyone who knew him has at least one "Townes" story. Harold F. Eggers, Jr., author of My Years with Townes Van Zandt, was Van Zandt's producer and road manager for more than 20 years, riding the road and sharing motel rooms with Van Zandt from his days promoting Van Zandt's early records to the very last days, right before Van Zandt's death. He has more stories than most. There's the tale of Van Zandt acquiring his fiddle player Owen Cody after Cody, who was playing with Billy Joe Shaver at the time, insulted Shaver's wife and nearly got beaten to death in the street by Shaver before Van Zandt intervened. There's the story of Van Zandt touring Northern Ireland during the Troubles, of getting hastily transferred from one inn to the other after he castigated the locals, of Eggers getting hit by a car after he walked into the wrong pub and beat a hasty retreat. There are several tales of Van Zandt sabotaging large venue shows because he saw it as a way to stay in the more intimate venues he preferred. Eggers, due to all of those years driving Van Zandt around to shows (and running out of a few with trouble on their tails), is in position to offer a unique perspective on Van Zandt. And it's often one of contradictions. Eggers paints a picture of an artist driven by superstitions, pawning guitars long enough for them to gather soul, fearful of the sight of a hat on a bed, and believing that airplanes had to have the "right" flight number. On one tour, he collected a trunkload of Bibles from every hotel he stayed in, to combat the demons and ghosts that he believed were always following him and talking to him. But there were also beliefs born of experience, such as making sure you mapped out an escape route from every place you were playing. His view that wives and girlfriends shouldn't join them on tours probably fit somewhere in between. Van Zandt also wanted recognition, but cared nothing for money, on one occasion tossing a sizable sum out of a window because he thought it would decrease Eggers's stress levels. A man who, when he started to get that much-desired recognition and success when Merle Haggard and Willie Nelson's version of "Pancho and Lefty" hit number one, was in such bad shape he needed to check into a detox center. And who, probably intentionally (even Eggers isn't always sure if Van Zandt was conscious of the damage he was causing in the moment), wrecked at least one record deal and recording session that, up until the moment he ruined them, he excitedly talked about as the big breaks he had been looking for. According to Eggers, he and Van Zandt frequently discussed a biography, with Van Zandt telling him to write it as it happened, to make sure he showed the bad as well as the good, and Eggers keeps that promise pretty well. He portrays Van Zandt as guarded but manipulative, as kind but more than a little volatile. Several times, Eggers remarks that Van Zandt's behavior made Eggers's PTSD flare up (Eggers is a Vietnam veteran), but Eggers' admiration and sense of a kindred spirit with Van Zandt -- Eggers theorizes that he and Van Zandt carried similar wounds despite their different histories -- always won out over the aggravation and stress. Readers won't get much insight into particular songs, though. According to Eggers, Van Zandt rarely, if ever, wrote in the presence of anyone else and claimed that the songs came from the ether. Eggers even tells one story of finding crumpled up pages containing unrecorded lyrics, which Van Zandt made him destroy after reading. Eggers presents Van Zandt as a songwriter who believed that he was literally grabbing songs from the air, but who also displayed a lot of craft and pride in what he did with the songs once he "received" them. As such, Eggers doesn't attempt to make many connections between Van Zandt's life and the songs he wrote. Eggers's emphasis on the time that he and Van Zandt spent on their own means that he limits his scope, so certain aspects of Van Zandt's life -- his marriages, his friendship with Guy and Susanna Clark, Van Zandt's career before Eggers became involved -- don't get as much coverage as they would in a more comprehensive biography of every aspect of Van Zandt's life. Still, Eggers provides plenty of insight into various periods of Van Zandt's touring and recording life, dropping details of unrealized projects such as a Van Zandt/Dylan collaboration, detailing the dark spiral that Van Zandt went into after being dropped by Tomato Records, or providing a solid sense of Van Zandt's all-day vodka philosophy. And then there's the book's final section, which hurtles along with a building sense of inevitability as Van Zandt prepares religiously for an album, only to go on a bender, break his leg, and then sabotage the sessions. It's not long before Eggers receives the call that Van Zandt has died at home. As Eggers was with Van Zandt towards the end, even driving him home that one last time, this part of the book contains an engrossing level of detail and tragic momentum. 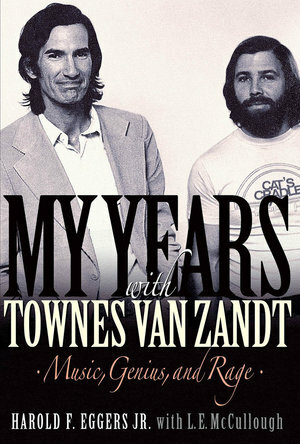 My Years With Townes Van Zandt is book-ended by a foreword and afterword courtesy by composer L.E. McCullough, and wraps up with several short addenda, including a count of the top 20 recorded Van Zandt covers, as well as a very useful discography of Van Zandt's numerous releases.